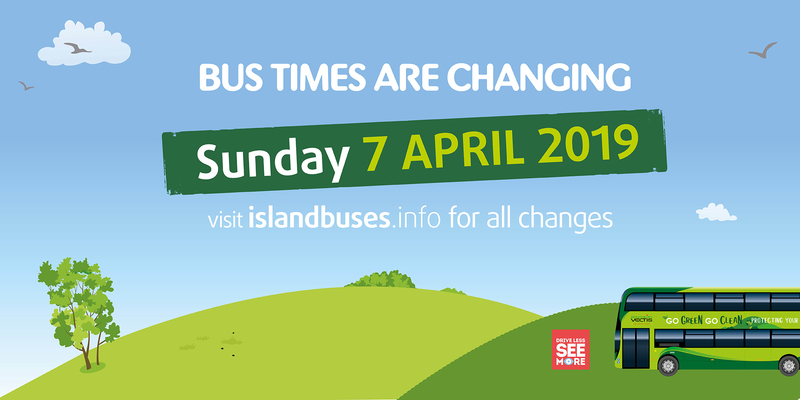 As of Sunday 7th April, Southern Vectis will switch to our 2019 Summer Timetable. As ever, we have endeavoured to make as few changes to timetables as possible, working to add additional buses and times to popular summer routes to ensure regular commuters are not affected during the high season. All Summer times are available to view online. Our brand new timetable book will soon be available to pick up from the Travel Shop, ferry ports and all other regular outlets too. If you rely on the bus daily for work and other appointments, we advise reviewing the new timetables in advance to avoid confusion at the time of the change. Minor changes have been made to journeys at peak times and on Saturdays and Sundays to improve reliability. Minor changes have been made to journeys at peak times, on Saturdays and evenings to improve reliability. Minor changes have been made to Newport arrival times during the week. Minor changes have been made to timings affecting some journeys. Timing changes have been made to some morning and evening journeys to help improve connections with Route 9. Small changes have been made to journeys at peak times to improve reliability. The 0935 bus on Sundays from Sandown to Newport will now start from Ryde. Additional journeys will run over the summer between Newport and the Isle of Wight Zoo, starting 22nd June until 31st August 2019. Minor changes have been made to some morning journeys Monday to Friday and on Saturday to help improve reliability. The 0030 bus from Ryde will now run five minutes later. Minor timetable changes have been made to improve reliability. An extra bus will run to and from Newport in the middle of the day allowing half-day visits to Tapnell Farm. Revised timetable and more journeys retimed for reliability. Some journeys no longer serving Crossfield Avenue. Majority of journeys revised for reliability.